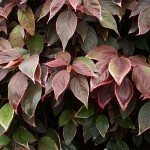 Do you have to remove flowers off a colored leaf plant? I am not sure on the type of plant that you are referring to, but regardless, there are very few plants that need to have their flowers removed. If the plant has finished blooming, it will not harm it to remove the spent flowers.